Install preferred solutions to gain added features and functionality for Dynamics 365 for Customer Engagement apps. The list of available solutions varies. 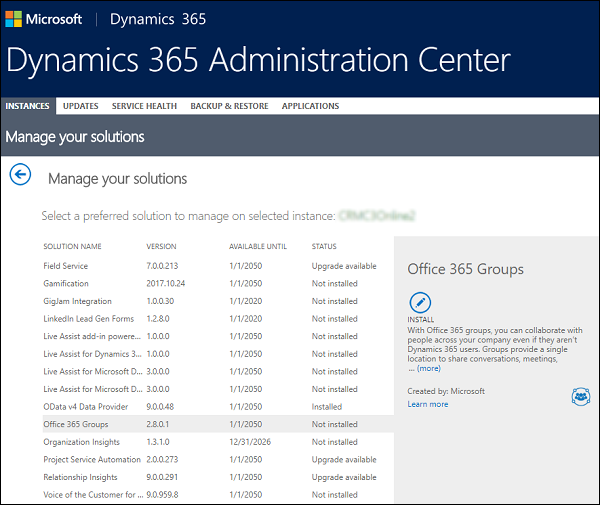 Some solutions like Office 365 groups for Dynamics 365 for Customer Engagement apps are freely available and visible by default. Trials for some solutions are gated and will only be visible if you go through Settings > Dynamics Marketplace or appsource.microsoft.com and sign up for the solutions. 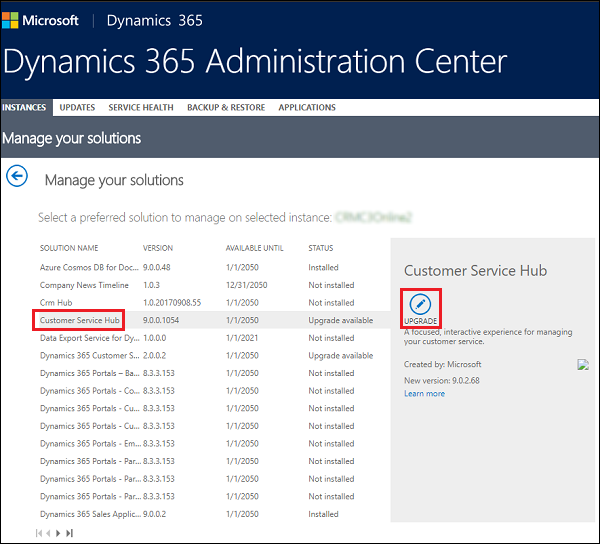 If you buy a new service subscription through Office Commerce, any associated solution installer also becomes visible in the Solutions tab after that purchase is recognized by the provisioning system. Sign in to https://admin.microsoft.com with your Global administrator or Customer Engagement apps System Administrator credentials. 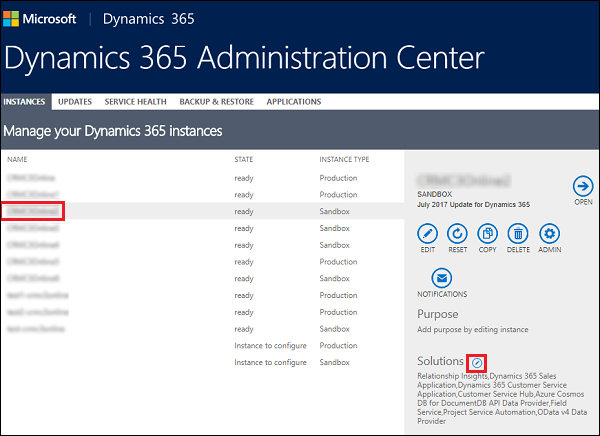 Select the Instances tab, and then select the instance to add the solution to. Select Manage your solutions . Select the solution you want to install and select Install. Proceed through Terms of service to accept the terms. The status for the solution changes to Installation pending. The status for the solution will change to Installed when the solution is ready. Select the instance with the solution to update, and then select Manage your solutions . Select the solution you want to update, and then select Upgrade. Proceed through Terms of service to accept the terms and start the upgrade. Sign in to Customer Engagement apps. Select a solution and select Delete.